Scotland made faster progress on broadband coverage than any other part of the UK last year, according to the Scottish government. 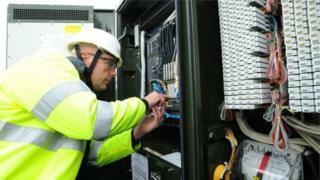 More than 800,000 homes and businesses can now benefit from fibre broadband as a result of a £428m rollout programme. Ministers say the Digital Scotland Superfast Broadband scheme is on track to hit its target of supplying 95% of premises by the end of this year. Their goal is 100% coverage in Scotland by 2021. Rural Economy Secretary Fergus Ewing said Scotland was heading towards that success rate quicker than any other part of the UK. He said: "Fast internet connection is vital to the economic and social wellbeing of our rural communities, supporting businesses and improving lives of local people. "However, these upgrades are not automatic. I would encourage more people to check whether they are eligible on the DSSB website and contact a service provider of their choice to start receiving faster broadband. "I am not complacent - I am aware that those who do not have access are at a disadvantage and our job is not done until everyone is connected. We are now focusing on the next steps to achieve 100% coverage by 2021." Robert Thorburn, Openreach digital partnership director for Scotland, said: "It's fantastic to be reaching smaller communities such as Gairloch, Drummore and Ballantrae and it means many people in these places can now order their fastest-ever broadband speeds from a wide range of providers. "With around a third of homes and businesses having upgraded to fibre so far, there's plenty of scope for more Scots to benefit from these much faster speeds." The superfast broadband project is being led by Highlands and Islands Enterprise in the north and the Scottish government in the rest of Scotland, with additional funding from the UK government, BT, councils and the European Regional Development Fund. UK minister for digital, Matt Hancock, said: "We know just how important broadband is in the digital age, and we'll continue to support Digital Scotland delivering on the ground so that by 2020 everyone in Scotland, and the rest of the UK, will have access to a fast, reliable and affordable internet connection."